When the rhubarb arrives in my small local grocer, late spring, it’s like a mid-year Christmas present. I don’t know where I got this fondness for rhubarb but it does seem to be a fetish of mine. Years ago, I remember having dinner in a rural cafe in Hamilton, Montana. You know, the old-fashioned kind of cafe/roadhouse where when you walk in, the selection of freshly baked homemade pies in a glass case next to the cashier, catches your eye. That evening, the case was sparse with a few slices of chocolate cream pie, apple pie and one lonely slice of rhubarb pie. My friend Cami, also a rhubarb fan, and I were set on sharing this sweet favorite after dinner. When it came time to order dessert, we watched as “our” slice of rhubarb left the case, only to be delivered to the table next to us. “Oh no!” we both cried in unison. The person about to dig in looked up and saw our dismay. He kindly stood up and walked the rhubarb slice over to us and sat it down on our table, giving up his slice of heaven so we could have ours. An act of kindness I will never forget, and a memory Cami and I will always share, giving us a good giggle always! As I still carry a torch for rhubarb, my heart leapt a little when I spied the tall ruby stalks, neatly lined up next to the lettuce in the produce department earlier this week. Immediately my mind began imagining how I would honor this humble and often neglected vegetable. Last year I created my Rhubarb Almond Meringue Cake. A stunner, definitely for a special occasion. This year I am simplifying. 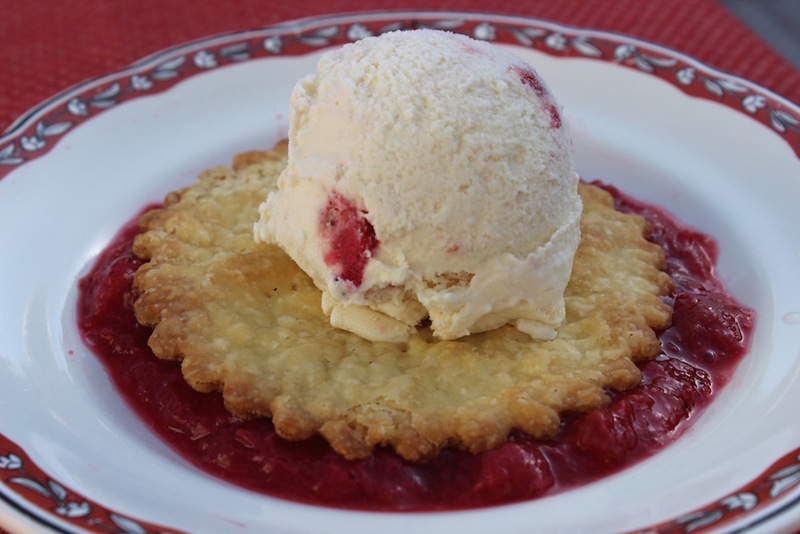 The stars in this recipe: a pâte fine sucrée (sugar crust) from Jacques Pepin’s book, “A French Chef Cooks at Home,” a compote of rhubarb, strawberries, lemon and sugar, and vanilla ice cream. A pretty and fun way to make a rhubarb pie. 1 crust pâte fine sucrée (Jacques’ crust recipes are my “go to’s for faultless crusts) Feel free to use your own favorite pie crust recipe. 3 cups rhubarb, cut into ½” cubes. If the rhubarb is cut smaller, it tends to disintegrate. ½ cup sliced strawberries (I had berries that were beginning to go bad so used them up) You can replace them with more rhubarb if you wish. Make the pâte fine sucrée, refrigerate, then roll out to ¼” thick. Cut rounds with a 4” scalloped cutter, prick with a fork and freeze for 15 minutes. This makes about 8-9 rounds. Meanwhile, preheat oven to 400 degrees. Combine rhubarb, strawberries, lemon juice and sugar in a saucepan and heat over medium heat, stirring until slightly thick. It will continue to thicken as it cools. This takes about 12-15 minutes. Remove from heat and let cool. Bake the pastry rounds for about 12 minutes until golden brown. Remove from oven and cool. 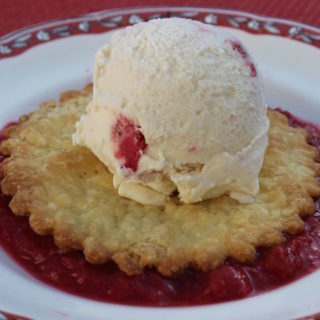 Soften the ice cream, then swirl in a few tablespoons of the rhubarb compote. Freeze until cold. Remove from freezer and using an ice cream scoop, scoop out the rhubarb swirl in neat rounds and place on a parchment lined paper. Refreeze until ready to use. Ladle about 14 cup of the rhubarb compote onto a dessert plate. Place the pie crust round on top of the compote, leaving a border of rhubarb. Add a scoop of rhubarb swirl ice cream on top. If desired, spoon on more rhubarb compote. This recipe can be made in stages and then assembled easily for dessert. For those of you who have never tasted rhubarb or think it tastes like something else, give this a go. One of my friends who happened to be over when I was making the compote, said she didn’t think she’d like it because it would be bitter. I gave her a spoonful to try and then she asked for another, larger spoonful!! Sold! Gonna try this! Sweet story about your rhubarb pie road trip cafe experience. Thanks Eva. You are the baker so give it a go!! My rhubarb-Romeo friend, you have ignited my taste buds! This recipe sounds scrumptuous, and the picture – gorgeous! I love this story, it is forever etched in my memory!! I believe the night started out with you ladies trying the liver and onions dinner I’d ordered. Good thing we had rhubarb pie to follow that flavor! 🙂 I am going to try this recipe, can’t wait until my spring elimination diet is over in one week. Thank you for this wonderful memory.